The book you hold in your hands represents the culmination of years of study, travel, observation, analysis, listening, collaboration, and conversation about environmental systems and society by a leader in the field. Chris Maser's courage and originality offer a legacy of experience to absorb, and then push further through our own choices, actions, and relationships. The scope of the book's ambitious vision reminds me of the first time I encountered two forces that are a foundation and springboard for my own work. The first is systems theory (through Fritjof Capra, The Web of Life) and the second is ecological resilience (C.S. Holling, Resilience and the Stability of Ecological Systems). From Capra's perspective as a physicist, our worldview, society, and institutions are undergoing a revolution from a hierarchical, top-down model to a system of networked structures. I see this change reflected in the rise and implementation of collaborative, trans-boundary ecosystem-based management (a move from solely managing single species for single goals within a single authority, such as a government agency). From Holling's perspective within ecology, all ecological systems are resilient to disturbance (including, but not limited to, human impacts) unless and until the system's adaptive capacities are overwhelmed. When overwhelmed, systems continue to self-organize, but may adopt forms that are starkly different than pre-disturbance. I see the theory of resilience embedded in restoration of aquatic ecosystems, including rivers and wetlands, and our embrace of adaptive management-learning from empirical observations of the system as we make decisions and take action (or cease actions) to support restoration and management. Both concepts—systems thinking and ecological resilience—conceive humanity as only one systemic node, not a superior control agent. In my view, these theories evince a powerful recognition and respect of the inherent dynamic and complex nature of systems and the interrelated nature of the whole. Systems thinking and resilience also represent a ground shift toward humility and responsibility. Elaborating humanisticly and at length on our place and ethical responsibility from a scientist's perspective is where Chris complements this theoretical lineage. Chris explains our Earth system components: atmosphere, lithosphere, hydrosphere, and biosphere. While humanity belongs to the biosphere, this recognition is only recently reflected in environmental law and policy (e.g., considerations of environmental and resource impacts on communities). Sometimes the realm we occupy is called the "sociosphere." While this term is more specific, it potentially replicates our persistent self-concept as separate and apart from the biosphere. Acknowledging and asserting our belonging to the biosphere allows us to be more mindful of the ways in which we are nurtured by the system as a whole, and the ways our actions affect the system and may threaten its nurturing benefits. Regardless of where we live, both our considerable benefits from the ocean and our impacts are abundant. And yet, our awareness of the ocean itself (and implicitly these benefits and impacts) varies widely. In the past decade, two experiences made me aware of the invisibility of the oceans despite the magnitude of their influence on our world. In the first, I opened a child's atlas to discover there was no mention of the oceans or their names. In the second, I attended a public lecture about the oceans in a large, urban auditorium, only to find in the audience one single other person there. If we are to adopt new ways of thinking that contribute to long-term sustainability, we need tools to help open our imaginations and our scientific literacy. This book is such a tool; it offers insights about the relationships between the land, sea, and people that could influence us toward better decisions. Chris defines social-environmental sustainability as a change in consciousness, where we embrace the biophysical dynamics (and limits) of the feedback loop of nature-culture and economics for the benefit of all generations. This concept advances the triple-bottom-line sustainability (analysis that requires arriving at decisions that simultaneously achieve all three: ecological-social-economic sustainability, rather than only one or two aspects) by referencing and incorporating the effect of our decisions on the biophysical system of which we are a part. Such a commitment evolves from more thoughtful decisions at the individual and collective level, through more holistic (as opposed to disparate) decisions (is this product or choice sustainable, via an analysis of the life cycle of the product or decision, instead of a disconnected, short-term or snapshot view). A practical transformation toward social-environmental sustainability is already beginning all over the world, across industrial sectors, neighborhoods, schools, and institutions, including universities. Traveling all over the world and meeting with community groups, tribes, and governments, speaking to audiences of all ages, and writing, Chris is one of the architects of sustainability for our age. Not many authors could so adeptly lead readers on such an intricate, yet accessible journey illuminating our complex relationships with the sea. 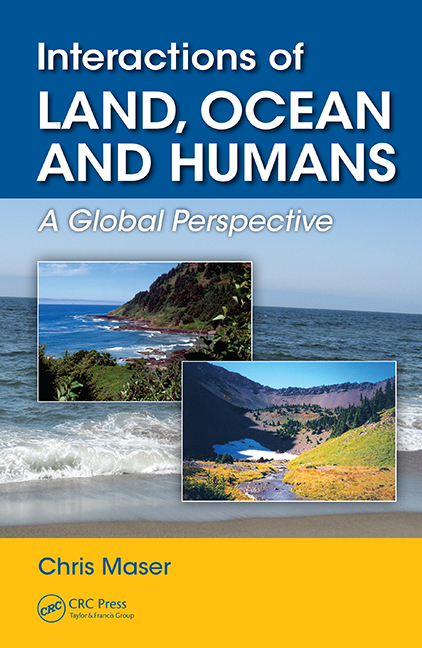 The book invites us to investigate the benefits we receive from the ocean (oxygen, rain, and marine resources, such as fish and shellfish, to name only a few), and the ocean impacts from our choices (for example eutrophication of coastal waters from excess fertilizer, chemical contamination, and ocean acidification from CO2 emissions). Interactions of Land, Ocean and Humans: A Global Perspective represents an important and unusually rich contribution to the understanding of the human dimensions of the marine environment. This book is to be treasured and shared on our journey. CAN ANYTHING BE DONE TO HELP PROTECT THE TERRESTRIAL SUPPLY OF WATER? WHAT ABOUT THE EXTINCTION OF OTHER SPECIES? PART III: CAN WE RECAPTURE NATURE'S BOUNTY—THE GLOBAL COMMONS OF LAND, SEA, AND AIR? WHY IT IS IMPORTANT TO UNDERSTAND AND PROTECT THE COMMONS? WHY WE ARE PROGRESSIVELY LOSING SIGHT OF THE COMMONS? Principle 6: We Must Honor Our Necessities and Consciously Limit Our "Wants"
Why Is Restoration Not Possible? A Functional Understanding of "Habitat"
CHAPTER 11, WHERE DO WE GO FROM HERE? WHO ARE WE AS A CULTURE TODAY? In reading this book, keep in mind that our earthscape is composed of three interactive spheres: the atmosphere (air), the litho-hydrosphere (the rock that constitutes the restless continents and the water that surrounds them), and the biosphere (the life forms that exist within and between the other two spheres). We humans, however, arbitrarily delineate our seamless world into discrete ecosystems as we try to understand the fluid interactions among the nonliving and living components of planet Earth. If you picture the interconnectivity of the three spheres as being analogous to the motion of a waterbed, you will see how patently impossible such divisions are because you cannot touch any part of a filled waterbed without affecting the whole of it. So it is that rivers of air carry water from the oceans to every location on Earth and thus not only are the non-substitutable source of our potable water but also give life to the soil and all that grows therein—our food. In turn, how we treat the land ultimately protects the purity of the world's air, water, and soil or degrades them with pollution. In like measure, the way in which we treat the oceans determines the long-term sustainability of their biophysical services, which we rely on for a good quality life, as opposed to a desperate struggle for mere survival. And, finally, how we act toward the air determines whether the world breathes freely or suffocates in pollution, which ultimately controls how the global climate reacts to the choices we make. Together, these three spheres form myriad interactive, self-reinforcing feedback loops that affect all life on Earth. And, it is the reciprocity of these feedback loops that form the legacy we leave—one that either liberates or progressively constrains all generations. The choice of how we, the adults of the world, behave is ours—either with psychological maturity and sacred humility or self-indulgence and monetary arrogance. How will you choose? Finally, this CRC series of books on the various facets social-environmental sustainability is a forum wherein those who dare to seek harmony and wholeness can struggle to integrate disciplines and balance the material world with the spiritual, the scientific with the social, and in so doing expose their vulnerabilities, human frailties, and hope, as well as their visions for a viable future. As the title of this book implies, the human component of the world is a critically important—but often overlooked or blatantly ignored—dimension of social-environmental sustainability. Yet, it is the integrity of the relationships among the diverse elements in any system that both defines the system through its functional processes and confers sustainability to the system in its functioning. Interactions of Land, Ocean and Humans: A Global Perspective examines this notion in terms of nature, culture, and the irrevocable, biophysical feedback loops between them. "Written by Chris Maser, one of the architects of the sustainability movement, Interactions of Land, Ocean and Humans: A Global Perspective explores a critical number of the myriad aspects that comprise the great, reciprocal feedback loops between the mountain peaks, the deep sea, and everywhere in between. Maser's exploration of these connections gives us the tools required to open our imaginations and our scientific literacy, offering insights into the relationships between the land, sea, and people that could influence us toward better decisions. "The author examines the hydrological cycle, hydrological continuum, and anthropogenic pollution of various kinds from the atmosphere to deep belowground. He also highlights connections by detailing how human behavior changes the atmosphere, which changes the oceans, which alters the climate, which alters the atmosphere and thus the ocean, and so on. The book then explores the biophysical commonalities between landscapes and seascapes, as well as the habitats, in each realm. It covers marine fisheries; marine protected areas; oceans as a commodity, as part of the global commons, as a biophysical living trust for which we are the trustees and the children of today and beyond are the beneficiaries; and more. "Can we arrest this deleterious process? Yes, but it will take a dramatic shift in human behavior worldwide. Why? Because, just as the collective human behavior and lack of awareness caused the problems in the first place, the level of consciousness that caused the problem is not the level of consciousness that can fix it. We must shift our thinking from that which is symptomatic to that which is systemic if we are to have a sustainably productive environment through time. Maser gives us the understanding of the biophysical interactions among the lands, oceans, and peoples of the world needed to create sustainable solutions to environmental problems." "It's been a very rewarding experience reviewing Chris's book, far more fun and educational than I ever anticipated. Through his work as a scientist and his personal experience, Chris takes the reader on a journey around the world to explain, understand and appreciate the scientific, economic and emotional linkages between the land, oceans and people. He reminds us that our actions today are the choices that will determine the environmental legacy we leave for future generations. Also, that if the human species is to exist we must do no harm to the very commons that support us at all levels of life. And, in conclusion, how we educate our youth will provide the foundation of hope needed to show the world that we must change our way of thinking if we are to save us from ourselves." Worked on habitat recovery of imperiled salmon in Washington State Governor's Salmon Recovery Office. "All life is connected, a universal concept that in Maser's lyrical prose pulsates with the constant interchanges between land and sea. Interactions of Land, Ocean and Humans: A Global Perspective describes a planet of marvelous and intricate design too precious to defile. Yet defile it we have, as Maser recounts in unflinching detail. Despite his disheartening review of how badly humans have behaved since the advent of agriculture, Maser manages to leave us with optimism. The way forward, he says, is to reconnect what we have broken—to reestablish the global commons. He challenges us to mend our thinking with cooperative humility. Acting now will leave a sustainable world as our legacy to all generations. Who can resist that hope?" "The oft quoted axiom that everything is related to everything else is widely saluted as a theoretical construct, but it is rarely seriously explored, perhaps because of the complexities of real life. This book is different. In Interactions of Land, Ocean and Humans, Chris Maser systematically describes often remarkably counterintuitive biophysical relationships and interactions. However difficult to understand and appreciate, everything, including humans and nonhumans, is an interactive, interdependent part of a system whole. And, forget about some idealized, reassuring notion of the balance of nature. Maser totally debunks such thinking with a hardy dose of cutting edge science and common sense." "Chris Maser's new book, Interactions of Land, Ocean and Humans, is an astounding book. It completes many tasks brilliantly: presenting deeply disturbing facts in a clear framework; giving the reader a lucid and well-organized journey through our looming environmental agonies; and bringing to light connections between land and sea many of us never knew were there. But the stupendous gift of this book is that Maser charts a course back to sanity. He shows the way step by step that societies, by cooperation worldwide, can restore the beauty and health of the earth for our sake and the sake of all the creatures with whom we share it. He has the courage to emphasize that this task requires our humility to succeed. Courage and humility are rare. Let us join with Maser and begin this essential task while we still can."